Bamboo being a grass species (Graminace) has over 1500 different types all over the world. Most bamboo species are found in Asia and Latin America, however some species are native to Australia, North America and Africa. Being the most versatile and fast growing plant in the world, these can range from tiny ground covers to standing up to 30 metres tall. Bamboo falls under two categories, clumping bamboo (symbodial) and running bamboo (monopodial). What divides these versatile plants into these categories is what type of rhizomes they grow from. Rhizomes are durable underground stems which produce new shoots, roots and more rhizomes. Running bamboo has long, fast spreading, adventurous rhizomes where as clumping bamboo has short, slow spreading rhizomes. Clumping bamboo (sympodial) produces new shoots close to the ‘mother culms’ which keeps it in a clump like fashion. The rhizomes being short, produce new shoots of bamboo. Running Bamboo (Monopodial) if grown in warmer climates can be very invasive. Long and adventurous rhizomes can continue to grow far outside the circle of culms for years to come. Running bamboo shoots grow from underground rhizomes. Bamboo Roots are fibrous, long and generally shallow growing. These grow from their rhizomes and can prevent erosion and stabilise soil. Running and clumping bamboo both store their energy in their rhizomes systems therefor creating new shoots. These shoots very quickly grow to nearly their full height and will end up staying the same or similar diameter for life. These mature and harden over time as branches and leaves are produced, which distribute energy back into the rhizomes. 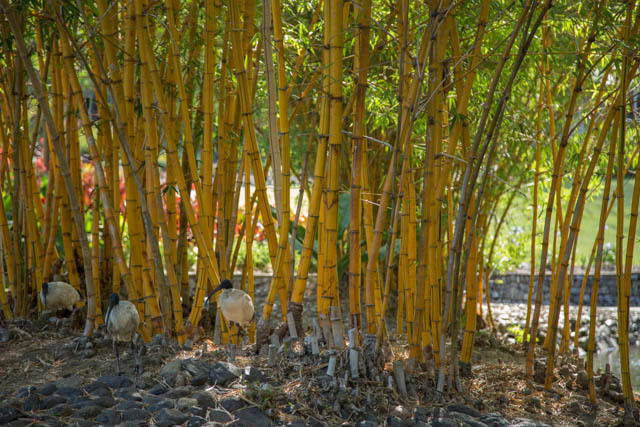 The typical hollow bamboo pole which combination of strength and flexibility allows these individual culms to live as long as ten to twenty years. Bamboo produces 35% more oxygen than trees, which means it’s absorbing a lot more carbon dioxide than your average tree. These plants are great for assisting and healing degraded environments, re-greening areas both rural and suburban. Being a very adaptable plant it is able to accommodate many diverse environment types. Resulting in a very easy plant to grow. The problem is many people don’t do their research before planting these incredible species. They end up with running bamboo in an area where only clumping bamboo would be suitable for. Golden Bamboo (Phyllostachys aurea), which is one of the invasive running bamboo species makes it a hard plant to contain. This particular species is what has contributed to bamboo getting a ‘bad’ name. Many gardeners consider them a pest. Without significant barriers or regular maintenance this plant can get out of control very quickly. When considering planting bamboo in your garden or property it is important to consider what the bamboo is being used for. For ‘screens’ it is recommended that Gracilis, Alphonse Karr, Fasca, SSFL, Ameonus, Oldhami and Ventricosa are planted. ‘Feature Plants’ Black Asper, Amoenus, Atro, Alphonse and Ventricosa. For ‘windbreaks’ Gracilis, Alphonse Karr, Fasca, Ameonus, Ventricosa and Oldhami. Just Stumpgrinding receives quite a few calls a week from customers wanting their bamboo removed. Our stump grinder machines can easily grind away all the root systems, rhizomes and shoots. We do recommend a deep grind of 400 to 500mm below ground level. This ensures we have destroyed any remaining root systems which won’t allow the plant to grow back. Our stump grinder machines will grind it into a very usable and organic mulch which can be placed on your garden.